When does she wax, when does she wane? The Moon waxes and wanes in rhythm with the seasons every year. 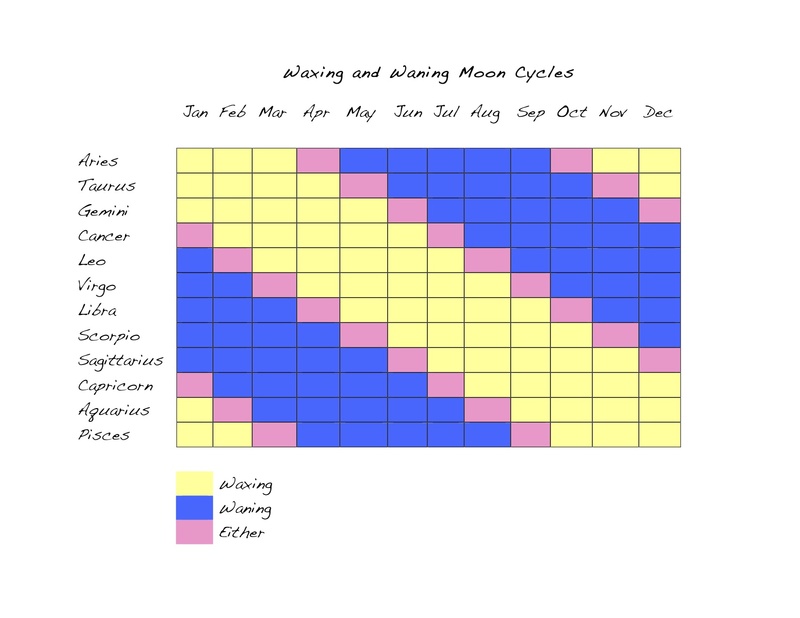 Since we may want to know when the Moon is waxing or waning so we can schedule our activities far in advance, I put together this handy little chart to help you see at a glance which phase the Moon is in each month of the year. Let’s say that you want to do something specific while the Pisces Moon is in its waxing phase. Find Pisces on the left hand side of the chart, then look for the months that are coded yellow. If you’re looking for the waning Pisces Moon, refer to the months coded blue. For months coded pink, refer to your annual lunar calendar because that tricky Lady Luna could be in either phase. She might even change from one phase to the next while still in Pisces. Moon in Cancer ~ Food, Glorious Food!